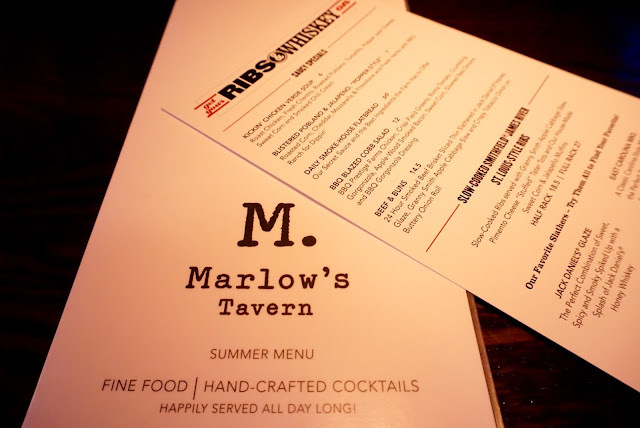 You have one week left to experience Marlow's Tavern Ribs & Whiskey menu. We had a chance to check out this delicious limited time menu prior to our Europe trip. The Ribs & Whiskey menu features barbecue, savory sides and handcrafted drinks. We enjoyed a few items off of this menu along with two specialty drinks. Gabe ordered the Slow Cooked Smithfield James River St Louis-Style Ribs with Jack Daniels Glaze. They were cooked to perfection and the flavor was exactly what a rib lover would look for. This came with three sides - Pimento Cheese Stuffed Tater Tots, Sweet Corn & Jalapeno Muffins and Granny Smith Apple Cabbage Slaw. Those taters were ridiculous and I BEG Marlow's to keep them on the menu. The two drinks we ordered were the Scrappy Old Timer, which is barrel aged in house - Old Forester 100, Suze Apertif, Cocchi Torino & Scrappy's Orange Bitter. I ordered the Ghost Pines Red Blend, which was a full bodied red wine with hints of brown sugar, spice and cocoa. It paired perfectly with BBQ! I could only eat 1/4 of this bad boy! Gabe brought the rest home w/ him for leftovers....he does not eat leftovers so that says quite a lot about this sandwich. Although there was no room for dessert, our server insisted we ordered the Bourbon Bread Pudding and I am glad for that as it was Creme Brulee soaked Cuban Bread with a splash of Honey Jack! Incredible. We were very impressed with this menu. I dine at Marlow's a lot in Orlando but this was my first time at the Tampa location. I was not aware until this visit that they do seasonal menu's. The Ribs and Whiskey menu will be around until October 17th and I look forward to seeing what is next!